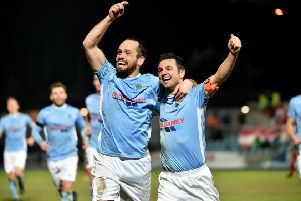 Michael Gault and Gary Twigg celebrate Chris Casement's goal against Dungannon Swifts in the 3-1 weekend defeat for Portadown. Pic by PressEye Ltd.
Portadown made the short trip to Stangmore Park on Saturday handed a boost by a four-game unbeaten run - but any pre-match talk of having turned the corner proved premature at the final whistle. Too many of the problems central to that six-game losing sequence across October and November returned to haunt the Ports last weekend as the ghosts of recent past took centre-stage. The Swifts have often offered Portadown a tough test thanks to derby drive and the potential prize of any bragging rights from claiming a senior scalp. However, on Saturday, the 3-1 defeat for Portadown proved as a result of the Swifts’ overall command of possession and chances. The afternoon’s opening goal handed Portadown control in what developed into a false sense of security as, on 12 minutes, Gary Twigg and Darren Murray combined to carve out a chance for the supporting Chris Casement to sidefoot home unmarked inside the area. The Swifts regrouped and former Portadown defender Andrew Burns took advantage of the visitors’ inability to clear the ball by directing the loose ball into the net. Portadown-born Ryan Harpur handed the Swifts the upper hand after the half-hour mark by converting on the run. Paul McElroy, who spent last season at Shamrock Park, wrapped up the misery with an injury-time drive. Portadown can point to key squandered sights of goal for Sean Mackle and Twigg in the second half but, overall, it was an afternoon to forget entering the Boxing Day derby date in Lurgan. PORTADOWN: David Miskelly, Chris Casement, Ross Redman, Keith O’Hara, Ken Oman, Darren Murray, Gary Twigg, Sean Mackle, Michael Gault, Tim Mouncey. Subs: Billy Brennan, Mark McAllister (on for Murray, 65 mins), Marcio Soares (on for Gault, 83 mins), Matthew Parker, Jake Richardson (on for Mouncey, 46 mins).